There is not one particular issue or activity that causes this condition, but your risk of plantar fasciitis increases if you are overweight, between the ages of 40 and 60, participate in long-distance running or ballet dancing, or spend the majority of your time standing on hard surfaces. Although the pain is often the worst in the morning or after exercise, allowing you to spend most of your day with no pain, if the condition gets worse it could end up affecting the way you walk. Since the body is all connected, changes in gait and posture can lead to chronic pain or injury in other parts of your body, like your knees, hips, and low back. This is why it’s important to treat plantar fasciitis before it gets worse. Keep in mind that most people recover completely with proper rest, ice, and stretching, though it could take a few weeks or months. While you can include over-the-counter pain relievers to help reduce inflammation and discomfort, take care that you’re not relying on them and powering through your day or your workouts like normal. Your feet still need time to heal, even if the medication is covering the pain. 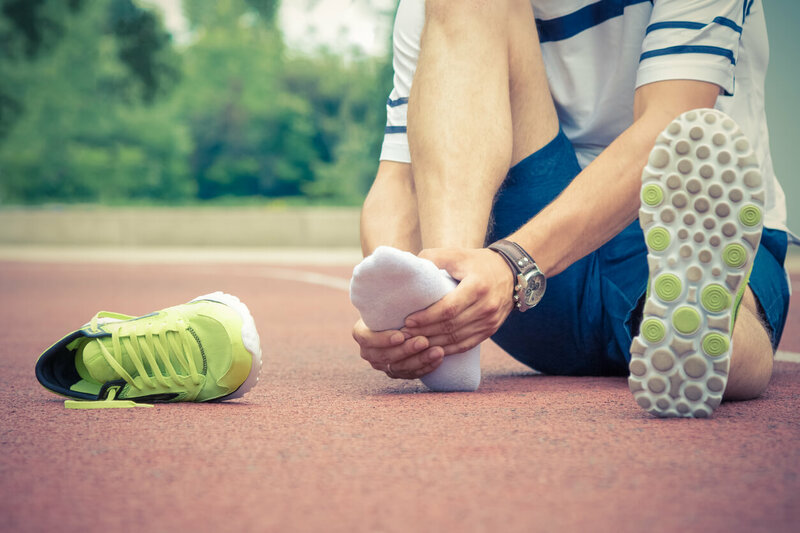 There are several simple exercises you can do to stretch and strengthen the foot to treat and prevent plantar fasciitis. Hold each stretch for 15-30 seconds, and repeat it on each side two or three times. While standing (perhaps using a wall for balance) or sitting, curl your toes so you can place the top of one foot on the ground and press gently to feel the stretch on the front of your leg. From a standing position, stagger your feet so one foot is a big step behind the other. Check that your back toes are pointed forward, and press your back heel toward the floor. Bend your front knee or take a bigger step if you need to increase the stretch. Kneel on the floor and curl your toes into the floor. Gently sit back on your heels so your weight is over your feet. This stretch can be quite intense, so a gentler version is to sit on a chair with one leg crossed over the other so you can reach your foot. From there, flex your foot and use your hands to gently pull your toes toward your shin. Sit in a chair, and wrap a towel around the arch of your foot. Gently pull the towel toward you. While you’ve got the towel, place it flat on the floor under your foot. Curl your toes to pull the towel toward you, then use your toes to press it away from you again. Place your foot on a tennis ball or foam roller and roll it back and forth from heel to toe. You can do this from a seated position, and when you’re ready to add more pressure, you can do it while standing with a wall for balance, if necessary. If you’re not sure whether or not your foot pain is indicative of plantar fasciitis, come visit us! Our physical therapists will perform a thorough evaluation to rule out any other potential causes for the pain. We’d love to meet you and help you develop a conservative stretching and strengthening routine to recover from plantar fasciitis.